The X-Factor USA is extremely close to the finale, when America will find out who their next vocal pop star will be. Six contestants remain in of the most heated competitions on television, and only four will advance to the quarter-finals of X-Factor. Who did enough to win your vote, America? Who made you cry like Bette Midler? Who made you reach for the remote to switch channels? Celeb Dirty Laundry brings you, once again, a full performance review of last night and an official Celeb Dirty Laundry poll so you can vote for the two acts you wish to see leave the competition. CeCe Frey – Mentored by Demi Lovato – Unplugged: Edge of Glory – Pepsi Song: Part of Me – For CeCe’s first song, we have to ask, has she ever heard Lady Gaga really dig into this song? It’s vocal ability beyond CeCe’s scope of understanding. Unfortunately, CeCe is not at the edge of glory, she’s at the edge of being voted off of the show. Yes, although her vocals were better than in previous performances, her first song was a below average rendition of one of Gaga’s biggest hits. Cece’s second song, chosen by the fans, should never, ever be taken on by any contestant on any talent show. Katy Perry is an artist that is auto-tuned to the max, so doing her hit on live television, without lip syncing, is a final death blow to even the greatest of artists. Quite simply, CeCe was absolutely ridiculous. OUR SCORE – 6 for first song, 3 for second song. 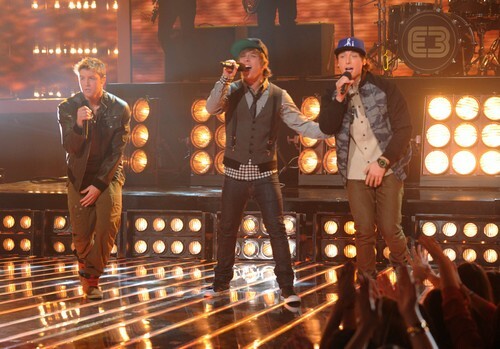 Emblem 3 – Mentored by Simon Cowell – Unplugged: Just The Way You Are – Pepsi Song: Forever Young – Emblem 3’s first song, the unplugged version, was an average performance. Their vocals were on par, their cheesy smiles were lit up by the faint yellow spotlight, and their pub-downtown guitar stringing worked, but – there’s always a but – Emblem 3 needs to learn how to connect. It’s all fine and dandy if you’re technically exquisite, but if you’re not able to connect with the audience on a deeper level, you’re just a bunch of guys jammin’. Looking into the camera while singing won’t help either – an emotional connect needs to be believable and needs to come from the inside. Emblem 3’s second song – great choice America – was much better than the first one. However, they still suffered from weird phrasing, hard vocals, and emotional disconnect. It could have worked, but it didn’t. OUR SCORE – 5 for first song, 6 for second song. Carly Rose Sonenclar – Mentored by Britney Spears – Unplugged: As Long As You Love Me – Pepsi Song: If I Were A Boy – Taking on Justin Bieber, in Carly’s first song, was a bit of a feat in itself. There are specific nuances and idiosyncrasies in Bieber’s voice that set him apart from other pop stars. People hate on Justin Bieber for his lyrics and his pop sugar performances, but many people do not understand, or realize, that Justin actually has a really good voice when he tones it down. Carly’s rendition of this Bieber hit was a bit on the safe side, although it was perfect in every aspect. She was, as a matter of fact, much, much better than Bieber. Carly’s second song should not be given to any garden variety singer. Beyonce’s vocals are beyond perfect, and Beyonce has an unparalleled level of control in her voice and performance. Fortunately, Carly is one of the best singers in the history of this series –except for Leona Lewis – so her vocals went above and beyond that of any normal singer. The control Carly exerted over the song was absolutely mind blowing, and, in our minds, Carly should be the winner of X-Factor USA. There’s no room for doubting Carly’s talent. OUR SCORE – 8 for first song, 10 for second song. Fifth Harmony – Mentored by Simon Cowell – Unplugged: Set Fire to the Rain – Pepsi Song: Give Your Heart A Break – Fifth Harmony’s first song, the Adele hit, could have worked. There was absolutely no emotion, and the girls weren’t able to completely connect with the song without sounding like a tribute act. They have done much better in the past. It was just too average. Their second song, the Demi Lovato hit, turned the tables on the other contestants. This was the first time since the live shows started that Fifth Harmony came together as a group and performed like superstars. If they were to release this song as a single, right now, it would be on top of the charts all over the world. This was the best performance of the night. – OUR SCORE – 7 for first song, 10 for second song. Diamond White – Mentored by Britney Spears – Unplugged: A Man’s World – Pepsi Song: Diamonds – Diamond did the first song during her first audition, but last night, the second time around, she completely blew it out of the water. Diamond’s vocal maturity is incomparable. She doesn’t just sing, she channels, and that makes for a magnificent vocal artist. Diamond’s second song, the latest Rihanna hit, was just as excellently executed by the young star. As with Katy Perry, it’s really difficult for any artist to take on Rihanna and make it sound believable and current. Diamond was in danger of going home this week, but hopefully her performances will keep her around for a little longer. We can only hope. – OUR SCORE – 10 for first song, 9 for second song. Tate Stevens – Mentored by L.A. Reid – Unplugged: Livin’ On A Prayer – Pepsi Song: If Tomorrow Never Comes – There’s a very valid and a very strong chance that Tate might win this entire competition. Country is not dead, because Tate brought it back to life, even though it is necrotizing and zombified. We’re going to say it, we are. Tate’s first song, the Bon Jovi classic, was absolutely mind blowing. He was able to connect on a deep emotional level unlike never before. This first performance might have kicked him back into first place on the leader board. Tate’s second performance reverted back to safe and comfortable, but Tate should not be penalized for America’s choice. – OUR SCORE – 9 for first song, 7 for second song. What did you think of last night’s performances? Were you pleased with the contestants? Let us know your thoughts in the comments below and remember to vote in our official Celeb Dirty Laundry Poll. Stay tuned to Celeb Dirty Laundry for all of your X-Factor news, reviews, recaps, and spoilers. We don’t miss a beat, and neither should you. Who Will Be Eliminated From The X Factor Top 6 Tonight?